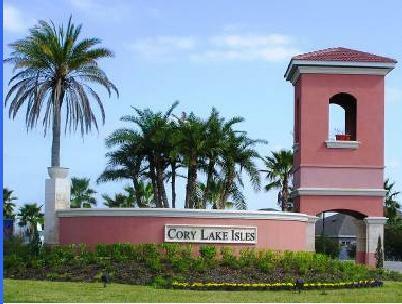 Cory Lake Isles sets the standard when it comes to living in a secure, gated waterfront community with an abundance of modern amenities. The family friendly New Tampa community sits on the shoreline of Tampa’s largest lake, 15 miles north of downtown Tampa. Cory Lake has uniformed security guards, who also patrol the community 24 hours a day, seven days a week to provide maximum safety. Plus, you’ll find tons of recreational amenities, including a 165-acre lake for skiing and boating, tennis courts, several playgrounds, a rink for hockey and skating, a beach volleyball court, basketball courts — and a beach area with white sands for relaxing and enjoying sunny Tampa days. You can enter the Cory Lake Isles via East Fletcher Avenue and Morris Bridge Road or Cross Creek Boulevard. As you enter, you’ll discover 12 miles of palm-tree lined, brick-paved roads winding throughout the community. As you meander down the streets, you’re sure to enjoy the luxurious tropical landscapes and a wide variety of wild life, such as fish, exotic birds, turtles, and even an occasional armadillo. Cory Lake Isles also includes a 6,000-square-foot Waterfront Beach Club with a workout facility, free wi-fi, a lending library, and a common area. Many homes are also on the waterfront or have picturesque lake views. Others offer wonderful vistas of the adjacent 1700-acre nature preserve . Cory Lake families also have the opportunity to send their children to New Tampa’s highly-rated school district. And if you don’t want to go downtown Tampa, you’ll find plenty of shopping, dining, and entertainment options nearby in New Tampa. If you want to discover all that Cory Lake Isles has to offer, call us today at 813-431-2840. We are here to help you find a home that perfectly meets your needs in a community you love. We’ve sold over 4800 homes in the Tampa Bay Area, and our experience, commitment, desire to exceed expectations, and best-in-class customer service ensures a successful home buying experience.